Father Rick Heilman may be known for his spiritual direction on Relevant Radio’s “The Inner Life” show, but he’s also on a mission to raise up an army of men that God can use — men who are in a state of grace, Eucharistic-centric, and submissive to his will. Since he founded the Knights of Divine Mercy in 2006 at his parish communities of Pine Bluff and Mt. Horeb, Wis., in the Diocese of Madison, the group has grown to more than 300 “knights,” drawing 80 to 100 men regularly from hundreds of miles around to First Friday meetings, and is poised to go national. The group’s mission involves building up the spiritual strength of men, training them in the skills of successful moral living, and helping men discover how they are to cooperate with God’s grace. It aims to help men seek and perfect the virtues of prudence, justice, fortitude, temperance, faith, hope and love. The monthly meetings include Eucharistic adoration, devotional prayers and the Chaplet of Divine Mercy, confession, a spiritual talk, Benediction and social time. Jeff Mahoney says he was blown away when he first attended a “night of Knights” two years ago. Mahoney, already a devoted Catholic with a special devotion to the Divine Mercy, credits the group with helping him prioritize his life and put God first. He started to attend daily Mass and adoration and to pray the Rosary and Divine Mercy Chaplet. Prayer led Mahoney to talk to Father Heilman about his desire to serve the apostolate. Father Heilman, looking to expand the group nationally, appointed him executive director in June. Everything fell into place when Bishop Robert Morlino of Madison, a supporter of the group, offered some office space to the Knights in the Bishop O’Connor Pastoral Center. Over the past several years, the group has received more than 80 inquiries from around the country to form chapters. It now has a manual, bylaws and “battle pack” of prayer books and sacramentals to help structure those chapters. Several are already forming in Wisconsin, Kentucky and North Dakota. Mahoney says they would like groups to have the blessing of the bishop in their diocese. The group’s motto is Deo Submissus in Deo Potens (The one who has submitted to God is powerful in God). David Stiennon, 47, president of St. Ambrose Academy in Madison and a member of Blessed Sacrament Parish, has been driving 30 minutes to St. Mary’s in Pine Bluff for monthly meetings since the group started. He feels challenged to witness the faith in the larger culture. Madison is a very secular public-university town, notes Stiennon, and “ground zero” for human embryonic stem-cell research (some of the first patents were developed here). A multimillion-dollar facility is in the works to further that research, and the governor is extremely supportive of abortion and a no-exceptions rule that employers offer insurance coverage for contraception. 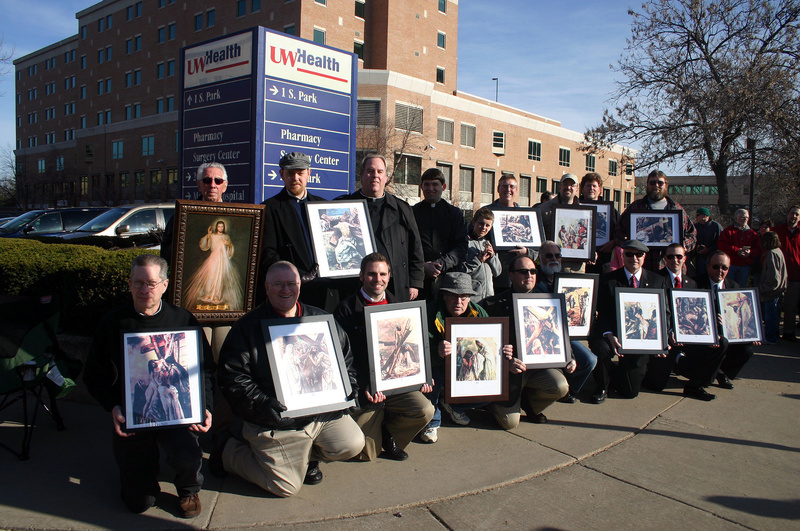 Stiennon started attending prayer vigils outside of abortion clinics and the 40 Days for Life vigil, hosted by Pro-Life Wisconsin. He joined hundreds of community members and 14 other knights outside of an area designated for a late-term abortion facility. The facility never opened, and the abortionist quit. He also got involved with helping to start a health clinic with pro-life, pro-natural family planning Catholic doctors. He even joined the Knights’ schola and learned to sing the Church’s traditional sacred music. The group has performed in parishes and events throughout the diocese, as well as the Shrine of Our Lady of Guadalupe in La Crosse, Wis.
“Father Heilman’s goal is to restore the sense of the sacred in our diocese, and he wanted to start by forming a choir. It brings the faith to your heart when you sing those chants,” says Stiennon. To start a Knights of Divine Mercy chapter in your diocese, visit KnightsofDivineMercy.com. This entry was posted on Monday, September 6th, 2010 at 7:49 am and is filed under Uncategorized. You can follow any responses to this entry through the RSS 2.0 feed. You can leave a response, or trackback from your own site. Hey There. I found your blog the use of msn. That is an extremely well written article. I’ll be sure to bookmark it and return to learn extra of your helpful info. Thanks for the post. I’ll certainly comeback.